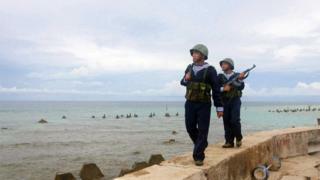 China claims almost all of the South China Sea, including reefs and islands also contested by other nations. The drilling expedition began last month in an area of sea about 400km (250 miles) off Vietnam's south-east coast. Exactly which company is not clear. In 2015, the Chinese rights were sold to a Hong Kong-listed company called Brightoil, but it has recently denied owning them. Two of the directors of Brightoil are senior members of the Chinese Communist Party. Talisman-Vietnam was formerly owned by the Canadian company Talisman, but since 2015 has been part of the Spanish-owned Repsol group. One analyst, who did not want to be named, estimated that Repsol has spent about $300m on developing the field so far. It has therefore come as a surprise to observers that Vietnam should have backed down so quickly. In 2014 coastguard vessels and other ships belonging to China and Vietnam confronted each other in a different area of the South China Sea, further north, near the Paracel Islands. Since then the two countries have tried to avoid confrontation.